Lydia, James, and I spent the New Year holiday up on Winslow Hill. This is a perfect time to get away to the quiet mountains and celebrate the passing of one year into all the hope and anticipation of a new one. It is a time for reflection. I counted my blessings acknowledging that this year I was able to spend more time in the mountains. My son also bagged his first buck, so that was another blessing. 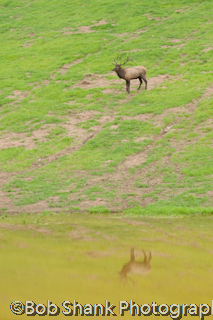 Time spent photographing the Pennsylvania elk is still another. Blessings abounded this past year! It is also a time to look ahead with anticipation upon the new year. What will this year bring? How many times will I get out to photograph wildlife? Will there be any noteworthy photo purchases this year? What will I learn? What will I see? Where will I go? I am getting eager and excited just thinking about it! Reflecting, pondering, hoping, and wondering are all important components to any New Year’s celebration. And I can think of nowhere better to do this than up in the mountains on Winslow Hill! I wonder what this bull is thinking as he looks ahead to a new year? 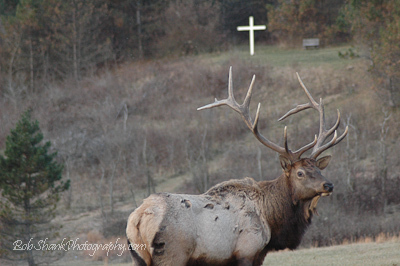 The beautiful elk in Pennsylvania provide plenty of different camera angles for us to capture. 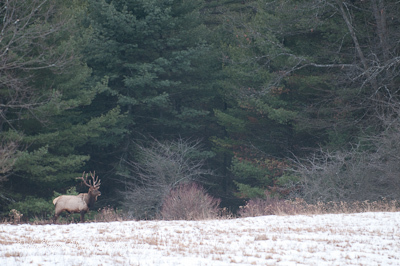 We photograph them in the rut, while they are eating and grazing, and even sometimes when they are bedded down sleeping. Some of us just cannot get enough of these magnificent creatures and we still have a number of dream shots we would still like to capture! Last week, when we were watching a small herd being controlled by a big bull, several other bulls came in to make a challenge for the cows. Early on in the evening we saw this bull moving toward the action. I snapped several shots as he made his way toward the cows, but this one specific shot presented itself and I could not resist. The water is in a limestone filter that is being used to reclaim the polluted waters from the strip mining that was done in the area. I just thought the reflection from the water presented a different composition than what I saw previously. What do you think of it?